This post aims to put forward the basics of Build Automation and also brief the steps required to put up a Pharo application on Continuous Integration, Inria which is a platform for Scheduled Automated Build. Triggered automation such as a continuous integration server running a build on every commit to a version control system. In recent years, build management tools have provided relief when it comes to automating the build process. Save time and money – because of above listed reasons. A build system should fulfill certain requirements. Frequent or overnight builds to catch problems early. Considering the above mentioned advantages of automated build, the below enlisted steps will help to put up your own Pharo application hosted on github on the CI server for continuous integration/scheduled build. 1. 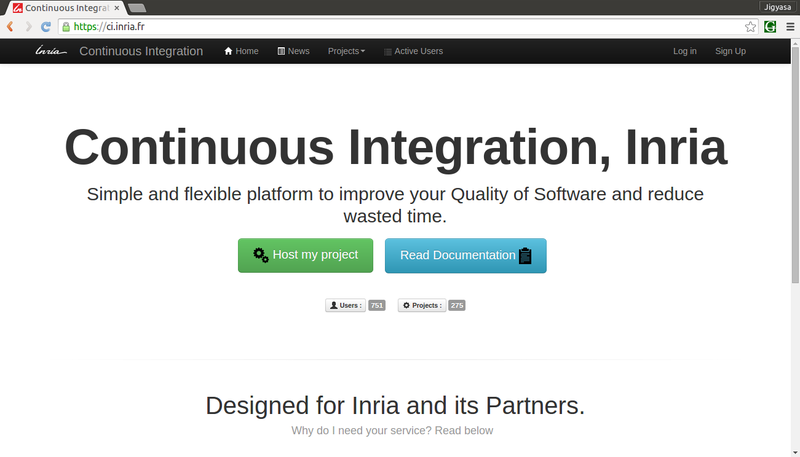 Log on to Continuous Integration, Inria website (https://ci.inria.fr/). 2. 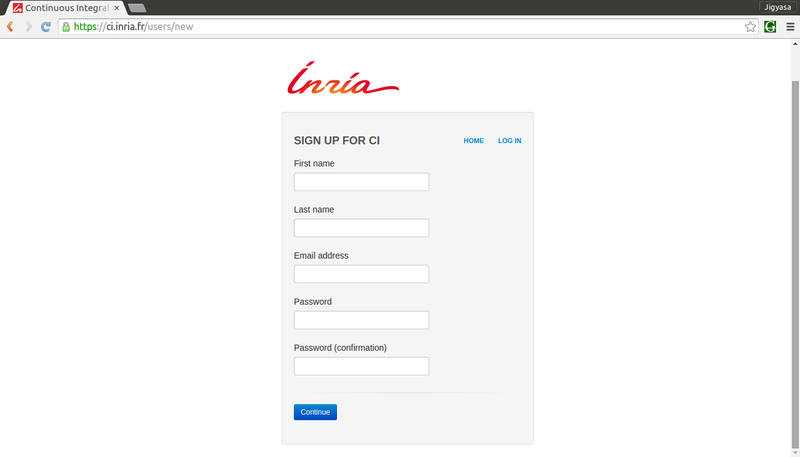 Click on ‘Sign Up‘ at the top-right corner, enter the required details and register for CI. 3. 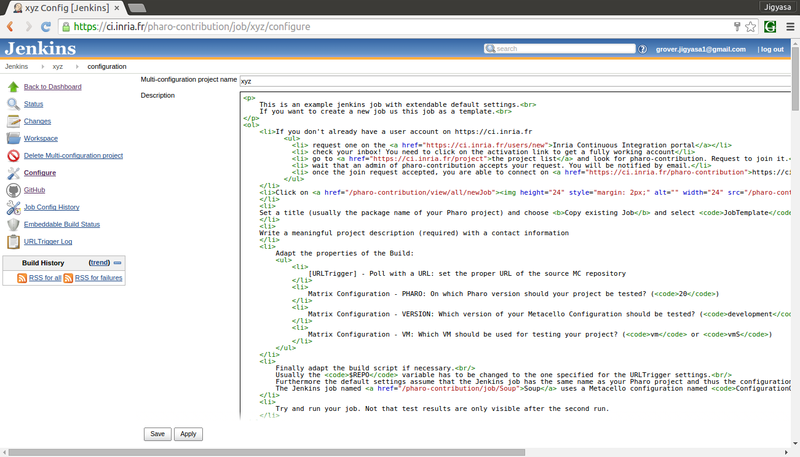 From the ‘Dashboard‘ option located at the top most of the screen click on ‘Join an existing project‘ blue button as shown . 5. On clicking the ‘Join‘ button, a message stating: “Request to join the project ‘pharo-contribution’ sent.” appears. 6. It might take a day or two for the request approval mail to deliver at your registered Email ID. Your request to join the project pharo-contribution has been accepted ! 7. 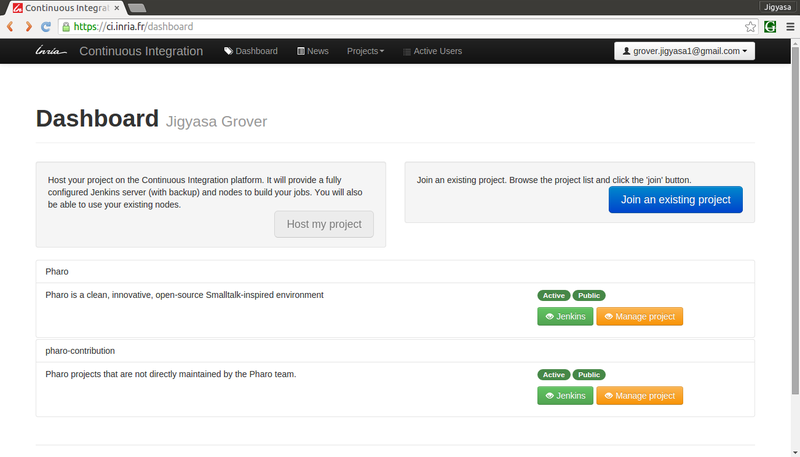 Click on ‘My Account‘ option and under ‘My Projects‘ check the status of pharo-contribution project. It should state ‘member‘. 9. Read all the steps mentioned carefully. 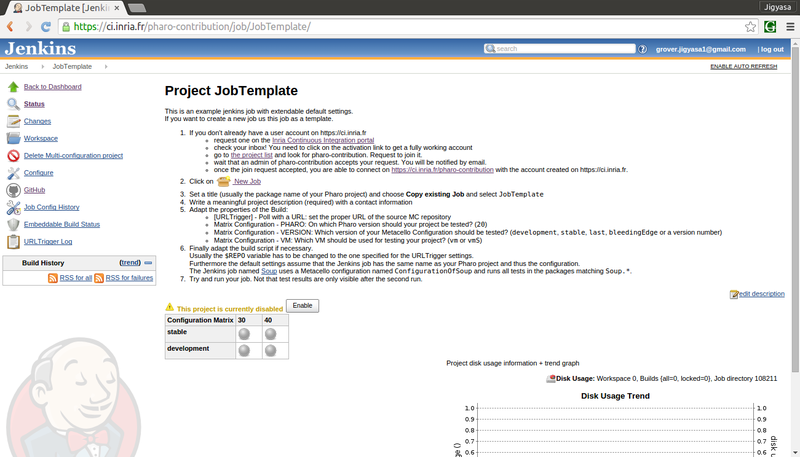 After going through all the points, click on the ‘New Job‘ mentioned in point 2 on the Project Job Template web page. 11. 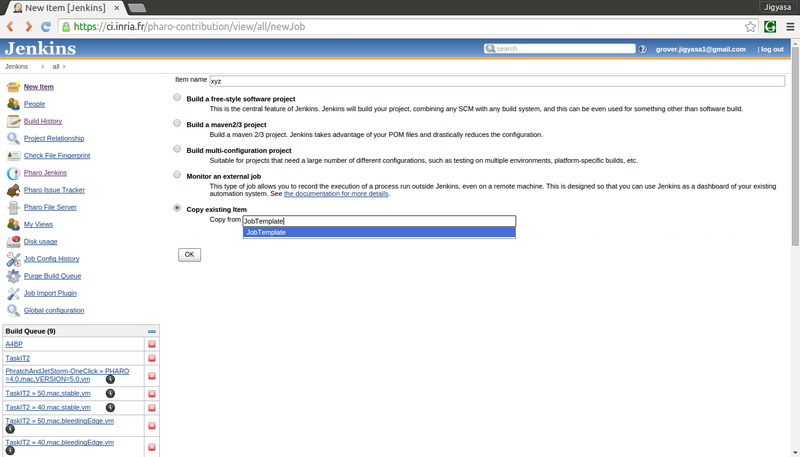 After clicking OK, You will be directed to your project configuration. 12. Fill in the description of the project in the desired box. 15. 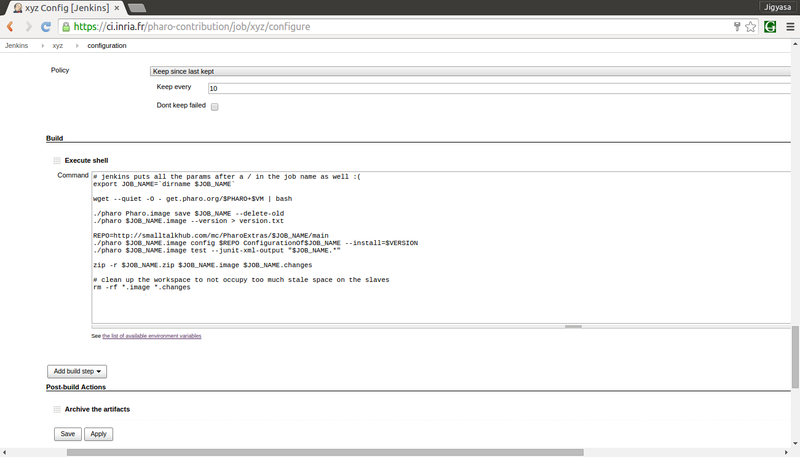 After saving and applying the changes, the application is all set for automated build. 16. 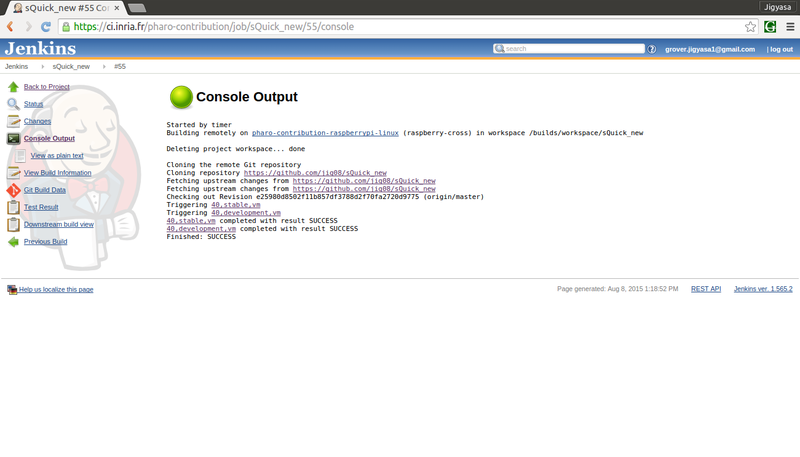 Each build’s ‘Console Output‘ can be used to analyse the steps and highlight the weak areas of the project. For instance: The below output is of a project whose stable version build was successful. TIP: Keep a regular tab on the build results and analyze each line of the Console Output with utmost care. Hope this post was able to help you start with the automation build process of Pharo Application. Do like if it was worth a read ! Post queries/suggestions as comments 🙂 Looking forward to them. Resources: Build Automation and Continuous Integration .